Cracking a tooth can be painful and, if left untreated, can lead to further oral problems. Teeth crack for a number of reasons including, chewing hard foods such as nuts or hard candy. A crack may form if you habitually grind your teeth or if you’ve sustained an injury to your mouth. Sometimes cracks may occur simply if the tooth gets warn down over time from misaligned chewing or faulty fillings and restorations. Teeth can also crack if exposed to extreme temperatures in a short period of time, for example, eating something very hot and then drinking cold water. A cracked tooth is painful because the crack often leaves the tooth pulp slightly exposed. When you bite down the crack may expand, revealing even more of the tooth pulp. The tooth pulp is a soft tissue that houses the nerves and blood vessels of the tooth. It’s important to treat the cracked tooth because the crack can leave the tooth pulp susceptible to disease. If your dentist detects disease in the pulp, you may need to get a root canal. If you experience any of the above symptoms, it’s important to visit your dentist immediately. It’s possible to treat cracks. The course of treatment will be determined by the size and location of the crack. 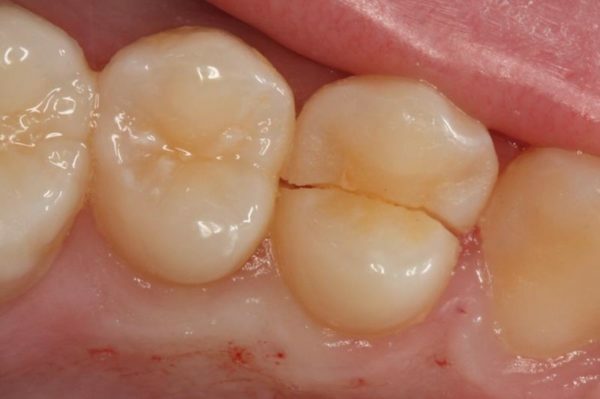 Your dentist may recommend filling the crack, placing a crown over the tooth to stop further damage, or a root canal. In extreme cases, when the crack is severe, they may need to remove the tooth. As with most dental issues, early detection and treatment is imperative to avoid more costly and painful issues in the future. Don’t hesitate to make an appointment with your dentist if you start to suspect that you have a cracked tooth.